Tyler was born in Vernon, British Columbia on May 23rd, 1979, but moved to Port Alberni shortly afterwards where he attended school and developed an interest in geology and mineral exploration. After graduating from Alberni District Senior Secondary school in 1997, Tyler completed an Honours degree in Earth and Ocean Science at the University of Victoria, graduating in the spring of 2002. During his undergraduate degree, Tyler worked as a junior geologist at the Yoho-Burgess Shale Research Foundation, at the British Columbia Geological Survey, and in mineral exploration at Westmin-Boliden Limited's Myra Falls operations (now owned by Breakwater Resources). 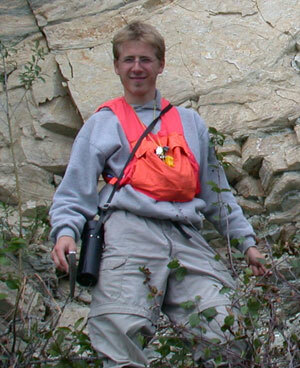 Immediately after completing his undergraduate degree, Tyler conducted regional mapping in the Stewart River area, Yukon Territory, for two field seasons as part of his M.Sc. research under Dr. Stephen Piercey of Laurentian University, and the Geological Survey of Canada's NATMAP program. After completing his M.Sc. thesis at Laurentian University in 2004 ("Petrology and Tectonic Significance of K-Feldspar Augen Granitoids in the Yukon Tanana Terrane, Stewart River, Yukon Territory"), Tyler accepted a consulting position with Cambria Geosciences of Vancouver, B.C., during which he had the opportunity to consult to 4 different junior mining companies on volcanogenic massive sulphide (VMS) exploration projects throughout British Columbia. In September, 2007, Tyler began research for his Ph.D. thesis ("Stratigraphy and Tectonic Setting of the Sicker Group and Contained VMS Occurences, Vancouver Island, British Columbia") under Dr. James (Jim) Mortensen at the University of British Columbia. Tyler is currently conducting fieldwork for his Ph.D. research on Vancouver Island, British Columbia. Rocks of the Sicker Group represent the evolution of a Mid to late Paleozoic volcanic arc system, and record the earliest development of the Wrangellian superterrane, a fundamental component of the North American Cordillera. To date, rocks of the Sicker Group have only been recognized on Vancouver Island, British Columbia, and are host to the largest producing volcanogenic massive sulfide (VMS) deposit in western Canada, the Myra Falls Mine (Breakwater Resources), and numerous other past producing VMS deposits and occurrences. However, the stratigraphy of the Sicker Group is poorly constrained, mostly due to the absence of absolute age control in the four geographically distinct structural uplifts where the rocks occur. The proposed research will combine regional and detailed geological mapping with geochronological, isotopic, and lithogeochemical studies to better understand the tectonic history and metallogeny of the Sicker Group. Geological mapping will establish contact relationships between rock formations and establish the geological setting of VMS and potential VMS occurrences. Geochronological work will employ U-Pb dating of zircons by laser ablation ICP-MS as well as Ar-Ar dating to constrain the ages of major igneous and sedimentary rock units and develop a detailed chronostratigraphic framework for each of the four structural uplifts. Whole rock lithogeochemistry together with Nd and Hf isotopic studies will be employed to constrain the petrogenesis of the Sicker magmatism and test for any possible involvement with the North American margin in the genesis of Sicker Group magmas. Lead isotopic compositions of sulphides from various mineral occurrences will be used to discriminate between syngenetic or epigenetic occurrences, in order to help evaluate the potential for additional large VMS deposits in the Sicker Group. Results of the study will enhance our knowledge of Wrangellian tectonic evolution and metallogeny, and lead to a better understanding of a critical part of the history of crustal growth in the North American continent.